So I stumbled upon this place quite by accident, buzzed past it at 50 mph and yet I really saw it. It was almost like I saw it in slow motion, as in a dozen things hit me all at once. I couldn’t seem to get the images out of my head. Two weeks later, I had to drive past it again, a little slower this time. At first glance, I had thought it was a burned out church but the second time I went by, I saw smoke pouring up from the chimney and realized it was a house. On a quick pass, it looks haunted and my first thought was, ‘Wow, there’s probably a great ghost tale there somewhere.’ But on my third trip up there, I stopped the car, got out and walked around the place. A little odd. Maybe a little creepy. But definitely not haunted. There are rusting hulks of cars, all blue 60’s Cadillacs, rusting in the tall grass, windows missing and vinyl roofs rotting or collapsed, with wildflowers and vines creeping through them now. 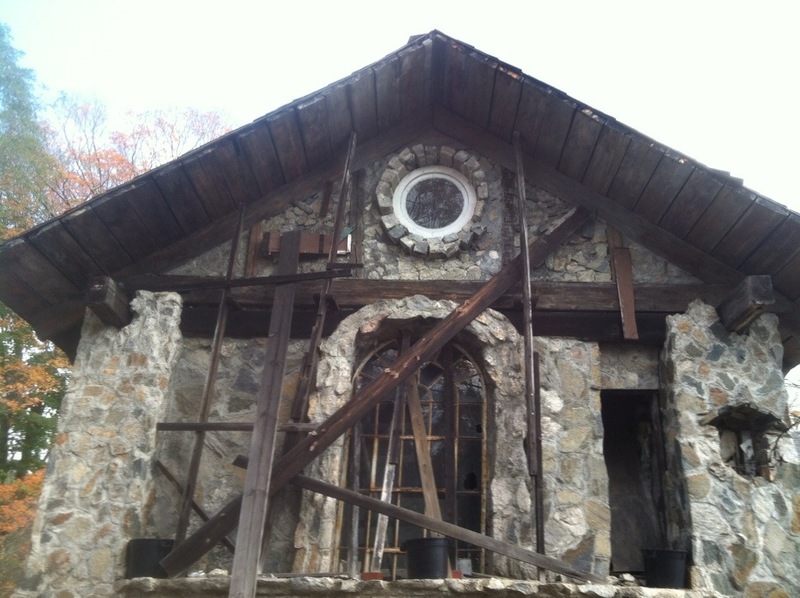 All around the house are piles of stone, half-constructed supports, and empty mortar buckets. The entire site is a study in contrasts and incongruities. Roman columns support a portico piled floor to ceiling with all sorts of reclaimed wood. Pink and purple flowers are growing up through old contractor’s buckets left toppled over in what seems to have been a place for a fountain. Yellow flowers found a home next to a pile of common red bricks. And the house itself is a commanding sight with perfect pointed arch chimneys, massive roof timbers, and soaring multi-paned windows that are stunning enough to draw the eye away from the broken panes, the half dozen abandoned cars and piles of loose stone and bricks. All give the appearance of a once grand structure that has met it’s demise. A little time and research reveals the quite the opposite. 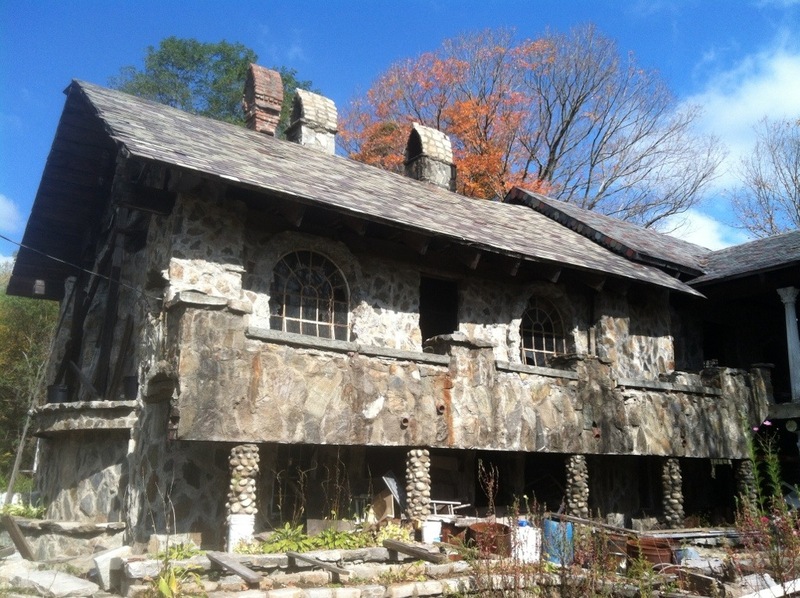 This great stone house is far from abandoned and destroyed. It’s merely under construction, albeit a very slow and laborious construction, all the work done by one man. Maybe it was too big a task for one man. Maybe it was a fool’s errand from the get go. But the beauty of the craftsmanship is undeniable. The attention to detail is incredible. Wandering through the overgrown yard, looking up at the walls, I could feel the love that had gone into the stonework. What keeps bringing me back to this place? There’s a story here. And in every story, I find a piece of myself reflected back to me. In this case, a work in progress. A wild, messy, sprawling wreck at first glance but on closer inspection, a beautiful, and unique if somewhat disjointed labor of love. Kind of like me. See, I tend to forget I don’t have to do this all by myself. So today, I slowed down and God and I wandered around in the mess. We looked up at the stones that have been placed thus far. And you know what? They ain’t too shabby. And as for the rest… Well, we’re not done yet.